MetLife Inc., the insurance giant that ended a discount for NRA members last week, had a 45 percent favorable rating, compared to a 12 percent unfavorable rating, before survey participants were informed of that move. After learning of it, respondents with an unfavorable view of the company increased to 25 percent, while its favorability rating rose 1 percentage point. Mimi Chakravorti, executive director of strategy at the brand-consulting firm Landor, part of WPP PLC, said in a Feb. 27 phone interview that firms are making fast decisions about their affiliations with politically controversial groups like the NRA because consumers are reacting quickly to how brands respond to political controversies. Christopher Stern, a MetLife spokesman, declined to provide an additional statement beyond the insurer’s initial Feb. 23 announcement that it was discontinuing its discount for NRA members. Representatives for Enterprise Holdings did not immediately respond to a request for comment. Lynda Maddox of the George Washington University School of Business said in a Feb. 27 interview that companies might also make the decisions strategically because they want to attract a politically engaged demographic, particularly millennials. “They gain more in the positive goodwill they get from disaffiliating than they would even from being silent, or certainly with supporting the NRA,” Maddox said. 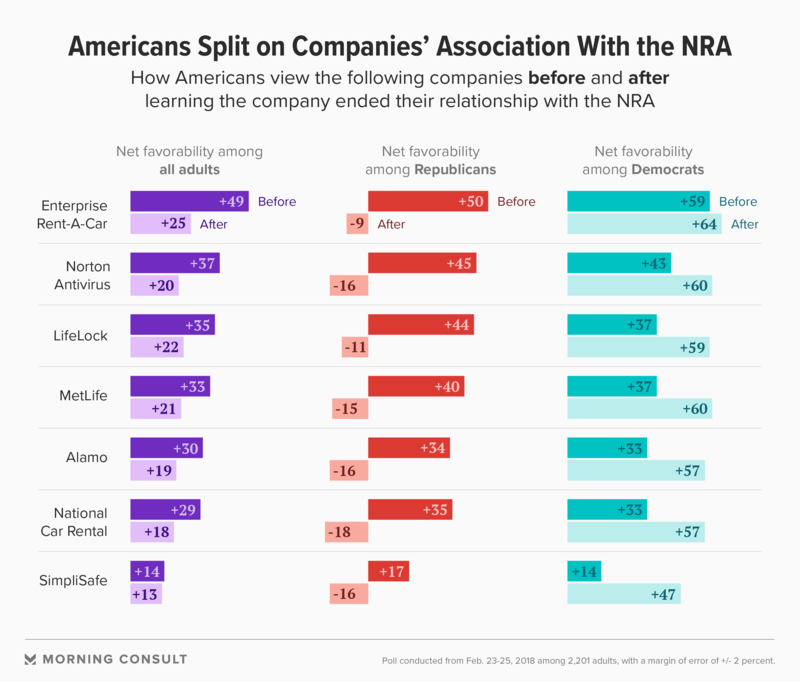 Correction: A previous version of this story misstated the level of unfavorability and the change in favorability for MetLife., and the accompanying chart misstated the net favorability of companies that decided to end their business relationships with the NRA.